Here is another one of my diversions from sports analogies to discuss a different topic. This is my first post that I am dedicating specifically to Mantis Pulse Analytics. I love to blog, and I really appreciate any opportunity to interact with you on Twitter and Facebook…with a slight dash of YouTube and Google+. But it was Pulse Analytics that set me on this blogging path. walk into a retail location to stand in a long customer service line to lodge their complaint. call your 800 number and follow the automated prompts that always seem to loop back on themselves until they are pulling their hair out. struggle to find your website so they can enter a feedback form or maybe even get a “live operator” who is working off of a carefully crafted, inflexible script or troubleshooting flow chart. What do folks do now? They potentially work themselves into a mob-like frenzy on those same social media channels. They may mention your official Twitter ID or go to your Facebook Fan Page, or they may participate in a spiraling rant on a personal/group wall or review site where you are not part of the conversation! They will talk about you wherever they want, whenever they want, and still have the expectation that you will find them amongst the noise and courteously engage to resolve their issue. Then along came Pulse Analytics as a social media monitoring solution! It finds those conversations on your official channels as well as throughout social media channels, blogs, news and review sites. It then measures customer sentiment on a spectrum. I am not here to tell you that automated sentiment analysis is foolproof and 100% accurate! Who would have thought that an F-Bomb could convey a positive sentiment…but it happens in some cases. Therefore, Pulse Analytics also supports corrective action on false positives or inaccurate sentiment analysis. Pulse Analytics then has the ability to aggregate by Sources (social media channels vs review sites, etc). It can also aggregate by Topic, Product Category, Sub-Brand or Time increment. 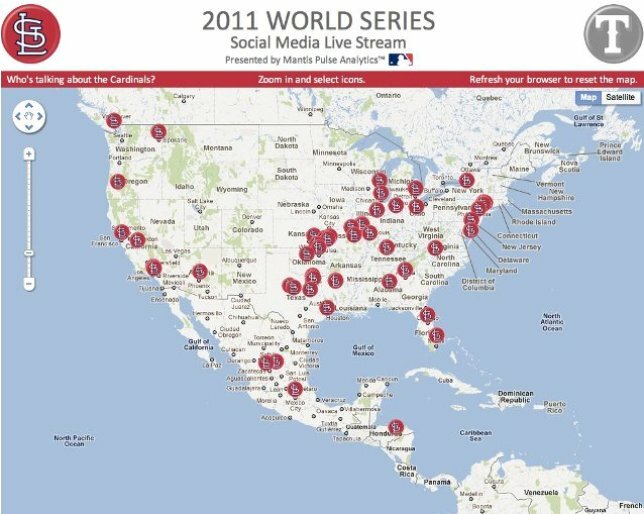 It can even show you where people are talking about you via a live map (check out what we did during the World Series)! Or perhaps you want to overlay calendar events or get some Share of Voice comparisons against competitors. All of that functionality is awesome, and it will help you see trends and feedback regarding product releases, promotions and marketing campaigns. It helps you find your brand advocates and your brand detractors. That is fantastic and actionable intelligence, but social media is also very focused on engagement. Engage and embrace those brand advocates. Come alongside those brand detractors and seek to courteously resolve their issues and perhaps turn them into brand advocates. Pulse Analytics supports that level of engagement, and I want to show you. You can go to the Mantis Pulse Analytics website or the Mantis corporate website to get the polished marketing view. This blog post is about me believing in our company, our product, and the people who dreamed of that product and made it a reality. This is me believing that Social Media is the New and Powerful Voice of the Customer and that brands need to stand up and take notice! True testimony trumps “marketing-speak” because people trust like-minded people versus a polished message. So let’s find where people are talking about you. Let’s measure that sentiment and help you become part of that conversation. Come back and visit the Pulse Analytics tab of my blog periodically, and I’ll pass along product update information or maybe just provide links to some of our cool and interactive Infographics like our NFL, Republican Candidate and X-Factor dashboards shown below. Go ahead, click on the pictures and have a little fun hovering and clicking! Thanks for your time…now back to our regularly scheduled programming of Social Media Sports Analogies! !